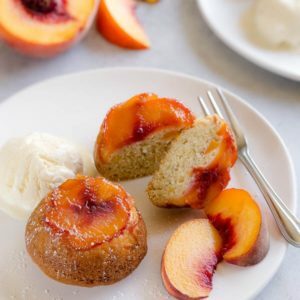 Summer classic dessert in bite-size! 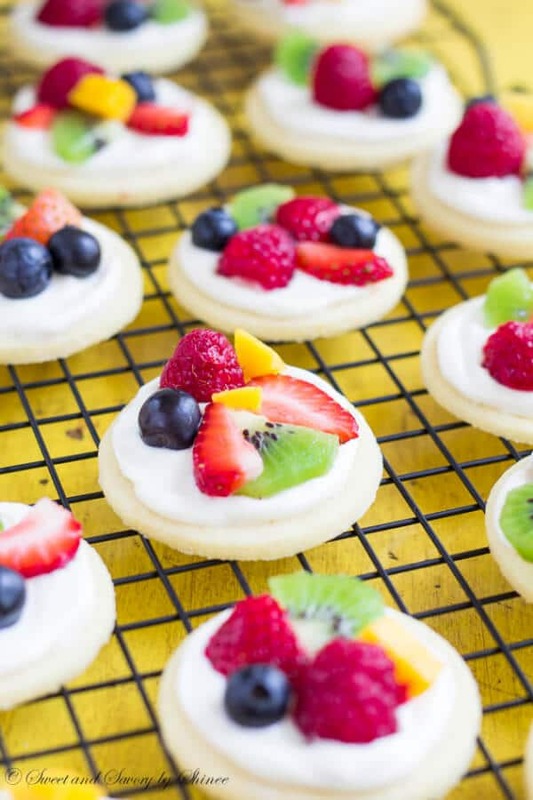 These mini fruit pizzas are built on simple soft sugar cookies and topped with white chocolate cream cheese filling and colorful fresh fruits. Fruit pizza is an absolute summer classic, or at least it should be. And why not to serve it in bite-size portions? Just look at these beautiful fruits. Almost all the colors of rainbow! I can eat them just like this for breakfast, lunch and dinner, no kidding. But today they serve way better purpose here. What makes this particular fruit pizza so special? The short answer is the filling! The long answer: creamy smooth, sweet and slightly tangy white chocolate cream cheese filling is the star of the show. That’s right, white chocolate cream cheese filling. Sounds delicious, doesn’t it? Now, here’s a quick visual for super easy, soft sugar cookies. Usually sugar cookies are on crunchy side, but we are adding a little bit of cornstarch in the batter for softer texture. The dough might seem like too sticky. Don’t worry though, after it’s chilled, it’ll be just right. Then onto the filling… Couple of things I’d like to address here. When selecting the white chocolate, buy the good stuff. Here is a great article about selecting good white chocolate. And lastly, you can prepare each layer separately up to a day in advance and assemble right before serving. To make the cookies, whisk together flour, cornstarch, baking powder and salt in a small bowl. In a mixing bowl with a paddle attachment, beat the butter and sugar until fluffy. Add the egg and vanilla extract and continue to beat for another minute or two until well combined. Add half of dry ingredients, then stir in milk, and then remaining half of the dry ingredients. 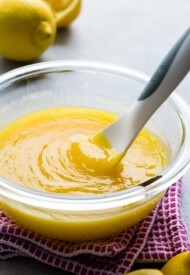 Mix until just combined, scraping the sides. The dough will be soft and slightly sticky. 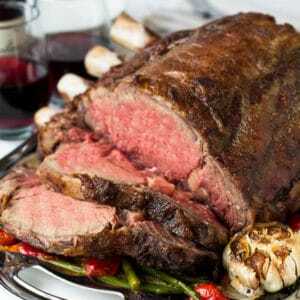 Wrap it into a plastic wrap and refrigerate for at least an hour, or up to 2 days. Preheat the oven to 350°F (175°C). Line two baking sheets with parchment paper, or silicone mat. On lightly floured surface, roll the chilled dough into 1/8-inches-thick circle. Cut out 2.5-inch circles. 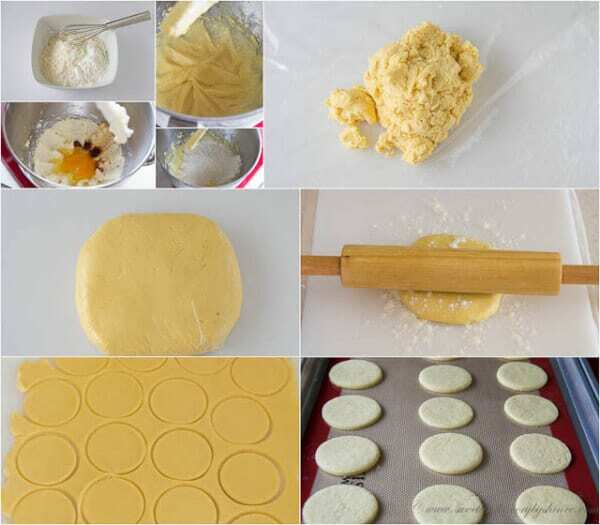 Continue to roll the leftover scrapes and cut out the small circles until you run out of the dough. Place the cookies on the prepared cookie sheets and bake for 10 minutes. (Slightly undercook them to get nice and soft “pizza crust”.) Cool completely on wire rack. While the cookies are cooling, prepare the cream cheese filling. Heat the heavy cream in the microwave for 30 seconds. Place the white chocolate in a small bowl and add the warm cream over it. In a mixing bowl with whisk attachment, beat the cream cheese until fluffy. Add powdered sugar, vanilla extract, and white chocolate mixture. Beat for 3-5 minutes, or until the filling is thickened and smooth. 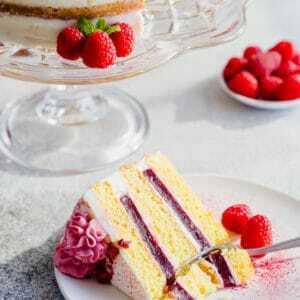 For topping, put the fruits into thin slices, if needed. 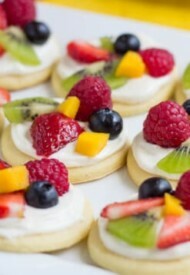 To assemble the mini fruit pizzas, spread about a tablespoon of cream cheese filling on each cookie with a butter knife. 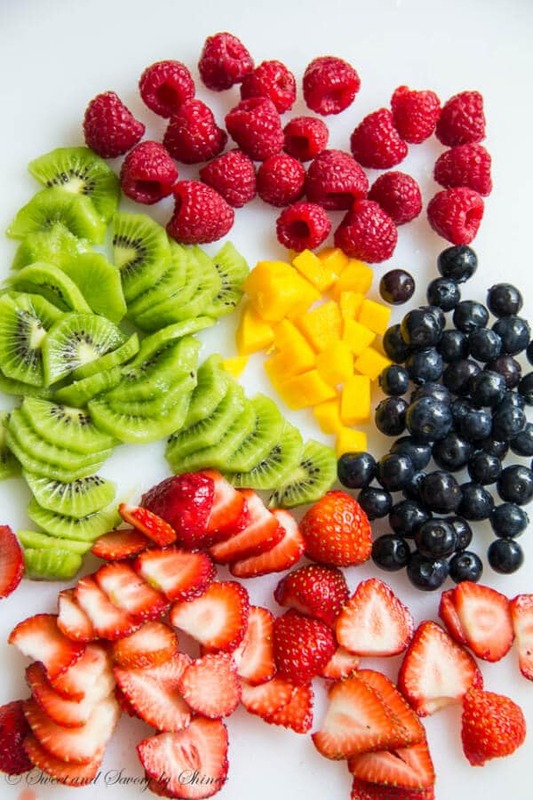 Arrange the fruits on top. That’s it! *You can choose any fruits you have on hand, or you like. 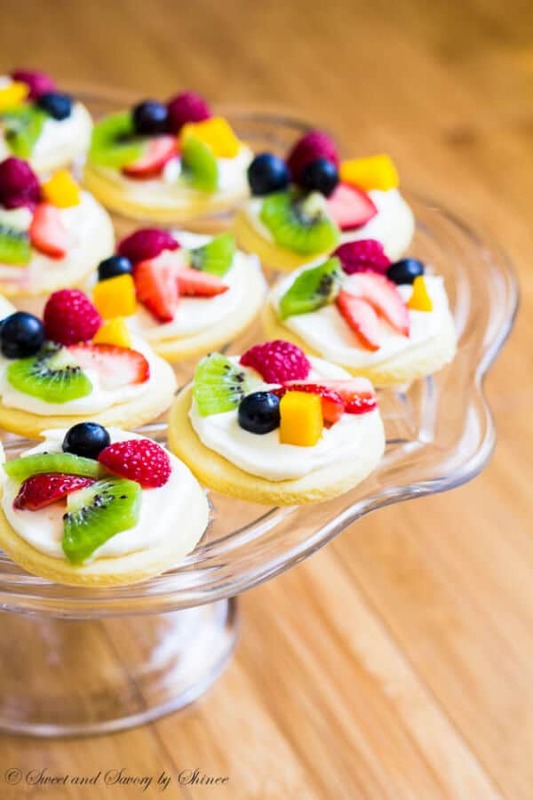 For beautiful presentation, choose different colored fruits, such as strawberries, blueberries, kiwis, mango, and more. 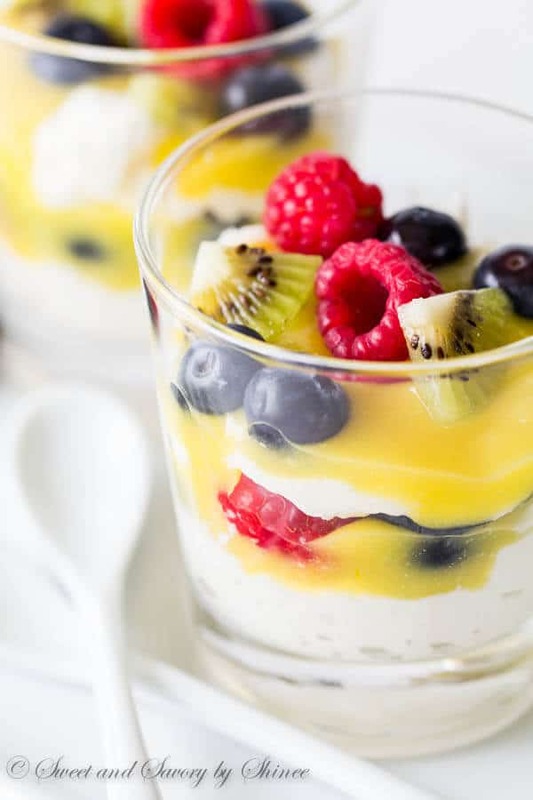 You may also like these fresh fruit desserts. I made this for my daughter’s 12th birthday party. I figured since it was a painting party they could use their imagination of assembling their own. This was an absolute hit with everyone. I used store bought sugar cookies since I’m not much of baking from scratch. I definitely saved this recipe and will use again for other parties. Thanks for the recipe. Hi, Shannon! Painting party? That sounds fun!! And I’m so glad fruit pizza were a hit! I love your clever shortcut with the cookies. And thank you for feedback. Would these keep overnight? Thanks! Hi, Cel. I recommend assembling them the day of serving, or else I’m afraid the cookies might get soggy. Hope this helps. Hi, Rebekah. I’d suggest to assemble no more than couple hours prior to serving. You can prepare the cookies and filling a day in advance and assemble right before serving for best result. Hope this helps. How many does this recipe make?! 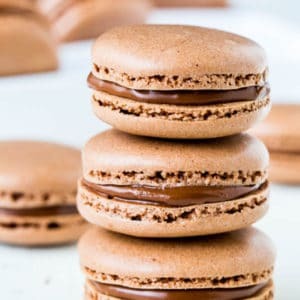 Looking to make them for a class of 24 and wanted to double it in case someone wants seconds! 🙂 Thanks! Love your idea and the ‘frosting’ – my concern is the fruit bleeding onto/into the frosting – also, dare you frost these in advance? I am 2 days away from doing this on mini waffles and your post is so on point – thanks for your sharing! Hi, Barbara! If you’re using fresh fruits, I don’t think there will be bleeding issue. I can see that happening with frozen or mushy fruits. And your mini waffles sounds amazing! If you get a chance to snap a photo, I’d love to see your finished version. Thanks, Yuliana. Yes, you can use whipping cream. Hello, these were delicious. I have a question, is the frosting pipeable. I’d like to try them on cupcakes. Hi, Jennifer. I’m glad you enjoyed these mini pizzas! 🙂 The frosting isn’t pipeable, but it’s not really runny either. I think you could smear the frosting on the cupcakes, instead of piping. I’m afraid it won’t hold its shape when piped. Hope this helps. Absolutely gorgeous pics! 🙂 Thank you so much for sharing this recipe at Freedom Fridays! Pinned and scheduled a FB share! 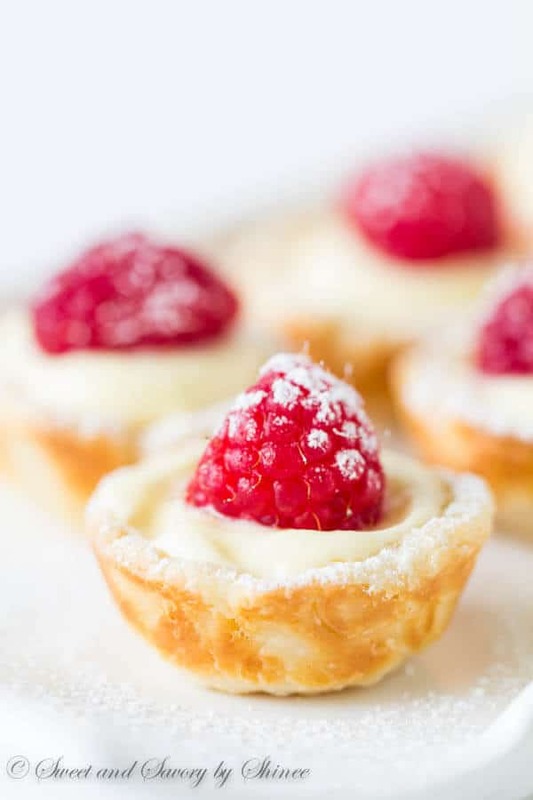 These look so yummy…the perfect summer dessert! I bet these are going to be a huge hit at our pool parties this summer! Sending lots of foodie love your way! Michelle, thank you so much! These would be fantastic for pool parties! 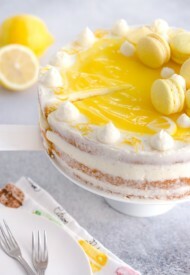 I make a similar ne with out he white chocolate!! Yours look so good!! I would love if you stopped by my place and shared your stuff on My 2 Favorite Things on Thursday Link Party. I’d love to have you!! Yeah, white chocolate adds nice sweetness! Thanks, Elaine! 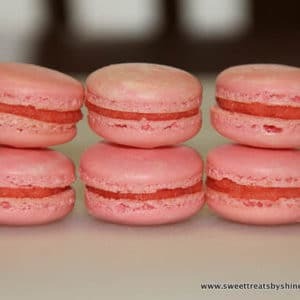 They are pretty simple, Maria, and oh so good! Thanks! Oh, I pinned this one! I love fruit pizzas, but this is just too cute in individual portions. Right? I love everything mini! Thanks, Pattie! 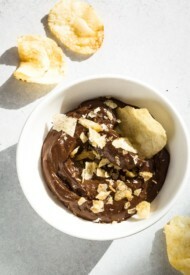 Shinee, Great job with the recipe and blog post. I’m really craving kiki now, lol. Pinning for later! 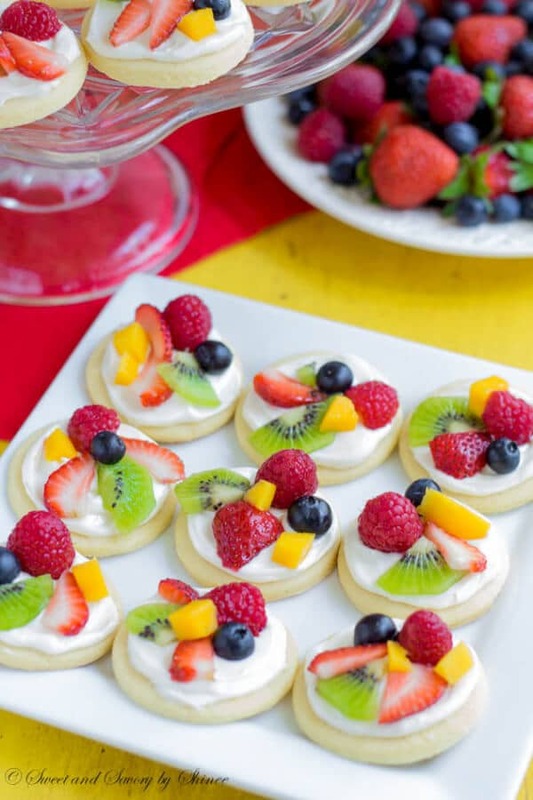 These fruit pizzas look so yummi. I have never made anything like this before. I guess I will try to make them. They are so fun and tasty. Perfect for summer parties. Hope you’ll love them as much as we do. Thanks, Liisi! Love this idea! My kids love fruit pizza. How beautiful! The colours are just stunning. I’m pinning this now. Thank you for sharing! Right? These little treats just scream summer! Thanks, Shannon! Such gorgeous little pizzas, Shinee – Pinned! Thanks, Dina! As always, thank you for stopping by!